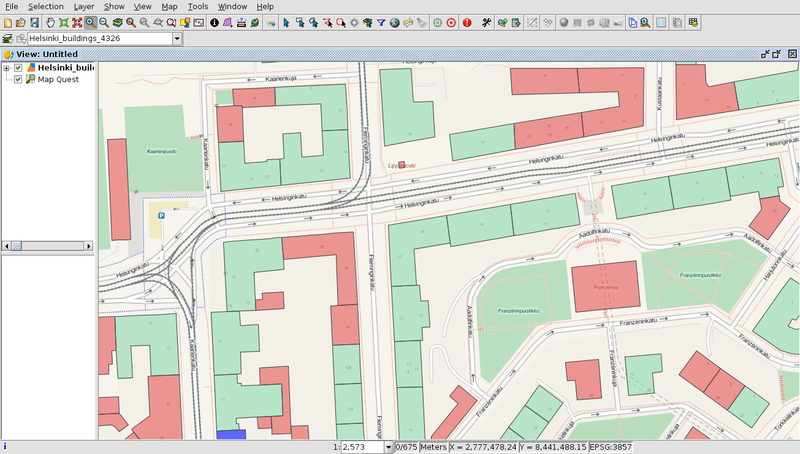 Some time ago, a tool to access to OpenStreetMap cartography was included at the gvSIG 2.0 version. But there was a problem when a layer available in other reference system was added at the same View, that wasn’t reprojected correctly. From the 2.3 gvSIG version this problem has been fixed, so it’s possible to load layers in a different reference system than the used one by OpenStreetMap (EPSG 3857) on the same view. If we have the latest EPSG codes database at gvSIG, that means, the 8.7 JCRS version, we would be able to look for that reference system at the database. The JCRS version used by gvSIG can be selected at the Preferences menu (Show->Preferences menu, and JCRS option). In case another version is used, the 8.7 version can be selected at that window and then restarting gvSIG it will be loaded. To load OpenStreetMap cartography with reprojected layers on gvSIG 2.x, the first step would be to create a new View with the OpenStreetMap reference system, that means, EPSG 3857. Then to “Add layer”, and “OSM” tab. One of the servers available at that window will be selected, like “Map Quest” for example. The OpenStreetMap cartography will be loaded at the View. The next step will be to load the local cartography. Some days ago, a post about the reading/writing option for PRJ files from gvSIG 2.3 version was published, so if the layer that we are loading at the View in EPSG 3857 is in a different reference system, and it has a PRJ file, it will be recognized and the layer will be reprojected on the fly. In case the file doesn’t have a PRJ file, its reference system has to be specified. After that, the layer will be loaded on the OpenStreetMap cartography, on its correct position. This entry was posted in english, gvSIG Desktop and tagged OpenStreetMap. Bookmark the permalink.